- WWE Champion AJ Styles was advertised to appear at last night's SmackDown live event in Laredo, Texas but he did not appear. Styles is scheduled to return at tonight's SmackDown in Corpus Christi for the Money In the Bank contract signing with Shinsuke Nakamura, which will be hosted by SmackDown General Manager Paige. 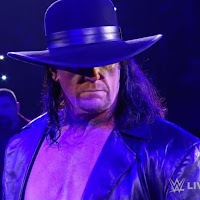 - As noted, The Undertaker's in-ring return has been announced for the WWE live event from Madison Square Garden in New York City on Saturday, July 7th. No word yet on why Taker is being brought back in July but it could be for the SummerSlam build. Dave Meltzer noted on Wrestling Observer Radio that Taker was not added to the MSG show due to low ticket sales as tickets are moving. - PROGRESS Women's World Champion Jinny has signed a WWE UK contract, according to F4Wonline As noted last week, Jinny will defend against WWE NXT Superstar Steffanie Newell at the PROGRESS Chapter 71 event on June 10th in Sheffield. Jinny signing with WWE is why she dropped the Revolution Pro Women's Title to Jamie Hayter over the weekend.